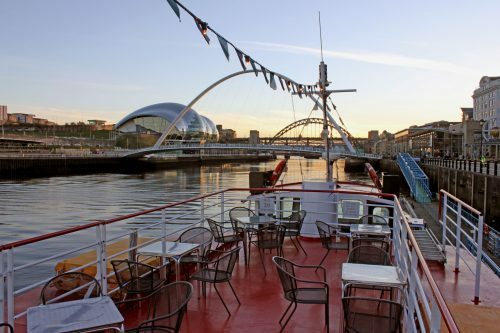 This 3 hour cruise takes you under the magical Gateshead Millennium Bridge, which opens especially for the cruise to enjoy the panorama of the Tyne Gorge before heading downriver as far as the river mouth. On your cruise you will see the legendary shipyards of Tyneside, the International Ferry Terminals, the Port of Tyne, the Fish Quay and unrivalled views of the river mouth, including Tynemouth Castle and Priory, the memorial to Admiral Lord Collingwood and the beautiful sandy beaches of South Shields. The cruise turns at the piers, where seals and dolphins are regularly spotted to then return to Newcastle’s Quayside. This cruise is complimented by a live commentary by one of our team of experienced commentators. Refreshments – Tea, coffee, refreshments and a fully stocked bar are available onboard this cruise.